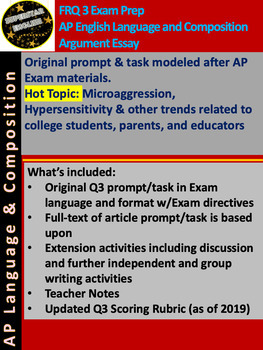 This original prompt and task modeled directly after AP English Language and Composition FRQ3 Argument Essay task tackles the very hot topic of micro-aggressions, hypersensitivity and other issues prevalent on college campuses nationwide. It prompts students to deeply think about the issue of "walking on eggshells" around and the "coddling" of American college students by their parents and college faculty and directly connect it to prior knowledge from their own arsenal of sources to create an exam-style argument essay. My students were totally engaged with this prompt! They noted that it was "relevant" and "thought-provoking". This helped them tremendously in developing close reading, critical thinking, planning, and well-developed writing skills that will help them to be exam- and college-ready.